Seattle-area TV commercial for Captain Morgan rum, circa 1991: "Hey there, Mariners fans, I'm your platooning catcher, Scott Bradley. Ever wonder how I keep my cool when a runner is bearing down on me at home plate? 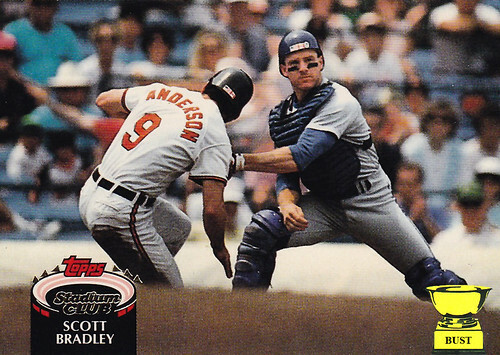 (Cut to shot of Bradley tagging out Brady Anderson at the plate, then pan out to reveal a posing Bradley.) It's because I've got a little Captain in me. Captain Morgan rum gives me the confidence I need to take the field 83 times a year. And when my batting average starts slumping below the Mendoza line, I can count on Captain Morgan to raise my blood-alcohol content above it. (Cut to shot of Bradley taking a shot of rum through his catcher's mask.) This smooth, spiced rum soothes my aching knees and takes the edge off when rumors start flying about a demotion to Triple-A. I'm Scott Bradley, and I've got a little Captain in me. (Cut to Bradley posing again.) Do you?" And this was before Brady Anderson grew a third arm and hit 83 home runs due to the steroids power of a steroids healthy diet steroids and plyometrics steroids steroids.